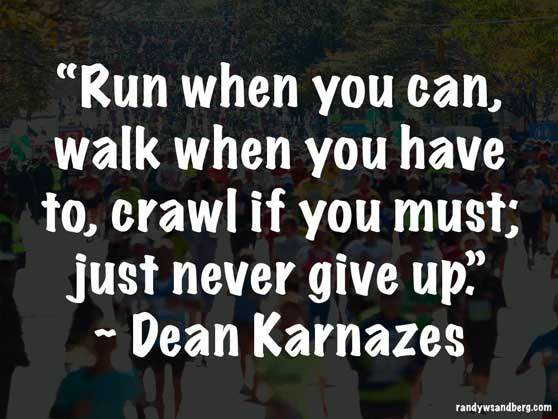 See the gallery for quotes by Dean Karnazes. You can to use those 8 images of quotes as a desktop wallpapers. Running back-to-back races requires a certain tactical prudence. Going too hard in any one race might jeopardize your performance in another. Maintaining proper hydration and caloric equilibrium also becomes increasingly critical. The first thing I do when I walk into a hotel is find the gym, and if they don't have a gym, I start looking for a handhold where I can do my pull-ups. Sometimes if a shower curtain rod is sturdy enough, I'll do them there. There are so many things in life that divide us, that separate us and tear us apart, be it race, religion, creed, socioeconomic level, nationality or any variety of other factors. But running is something that we all share in common. Toeing the starting line of a marathon, regardless of the language you speak, the God you worship or the color of your skin, we all stand as equal. Perhaps the world would be a better place if more people ran. Unlike the traditional athlete, I've got to do more than just engage in my sport to put food on the table. When I'm done running, it's straight to the office. When I was running across the country, I was doing 40 or 50 miles a day in sleeting snow with zero visibility for five or six days in a row. Ten to 12 hours of running in that is monotony beyond belief. Yes, my dad's a marathoner. 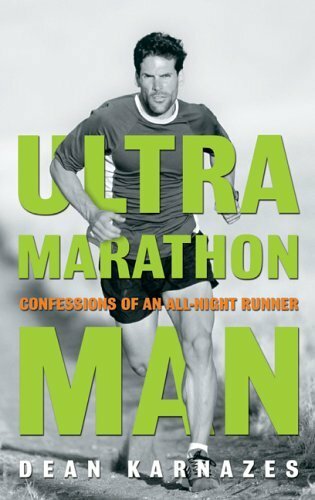 He used to do sprint distances and then started marathoning. My mom is an endurance animal. She does three-day events like the Susan G. Komen three-day walk. 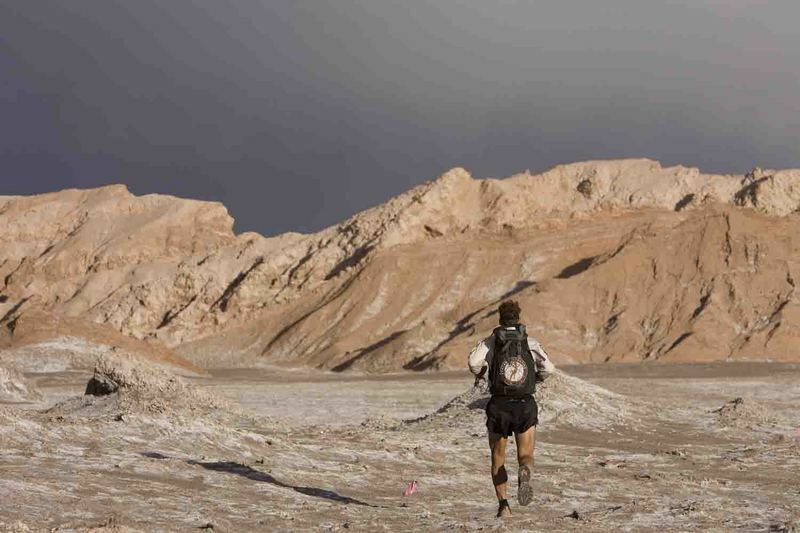 A lot of ultramarathoners are soloists. They're single and live lives off the grid. I have my whole office set-up at waist level; I don't sit at all during the day. Sitting, to me, is the devil. I love surfing, rock climbing, cycling - all that stuff. But it's just amazing that I can inspire people with my running. It's humbling, really. I love to run and I have some tips to keep it fresh and novel. I rarely use the same route twice. That keeps things new. I think I have some of my clearest thoughts when I'm out running. I went to college, grad school. I got an M.B.A., had a really cush corporate job. But I was just bored stiff. I didn't fit that mold. If you just go out there and run 100 miles, it breaks down a lot of barriers in terms of self-imposed limitations. Personally, I don't stretch, I don't get massages. Maybe massages would be useful, but I just don't have the time for it. Running is a simple, primitive act, and therein lays its power. For it is one of the few commonalities left between us as a human race. The human body has limitations. The human spirit is boundless. When I ran across America, for 75 days I ate 10,000 calories a day. I still lost about five pounds. During holiday parties when people used to ask me what I did for a living, I would tell them I sold resort timeshares. That was an effective conversational nonstarter, until I met someone that actually did sell resort timeshares. 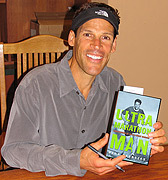 Much more quotes by Dean Karnazes below the page. I don't know about you, but all this modern technology that's supposed to save us time and effort has actually ended up making things more complicated in my life, eating up extra time. I don't know if I'm so much fueled by trying to one-up myself so much as passionate about coming up with new and greater challenges. I don't see it as a contest, but as a natural progression. I have an ElliptiGO. It's a standup bicycle. You don't pedal; you stride on it. It allows me to have the same striding motion as running without the impact. I run with a credit card and a cell phone, so when there is not a 7-Eleven around, like some of the country roads out there, I can get him to deliver a pizza to me. And I kind of give them a coordinate, a corner. Many athletes are seeking new and novel ways of pushing their limits, and the challenge of running back-to-back races is certainly one way to test the boundaries. Runners are competitive folks. I think some might feel slighted they haven't got more recognition. I think they have a point. In running, you won't necessarily get noticed just for turning in good performances.